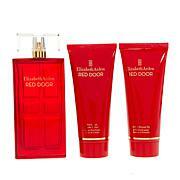 Giftable quartet of Elizabeth Ardens captivating, timeless Red Door fragrances. HYDROXYCITRONELLAL, ISOEUGENOL, LINALOOL, BUTYL METHOXYDIBENZOYLMETHANE, ETHYLHEXYL METHOXYCINNAMATE, ETHYLHEXYL SALICYLATE, EXT. VIOLET 2 (CI 60730), RED 4 (CI 14700), YELLOW 5 (CI 19140). GLYCERYL STEARATE, DIMETHICONE, PEG-100 STEARATE, PHENOXYETHANOL, POLYSORBATE 60, BUTYROSPERMUM PARKII (SHEA) BUTTER, CAPRYLYL GLYCOL, LANOLIN, POLYQUATERNIUM-22, XANTHAN GUM, TOCOPHERYL ACETATE, C13-16 ISOPARAFFIN, POTASSIUM SORBATE, SODIUM BENZOATE, LAURETH-25, DISODIUM EDTA, CITRIC ACID, ALPHA-ISOMETHYL IONONE, BENZYL ALCOHOL, BENZYL SALICYLATE, EUGENOL, GERANIOL, HEXYL CINNAMAL, ISOEUGENOL, LIMONENE, LINALOOL.